It's like going back twenty years and reliving those golden moments of your hard rockin' youth when the guitar sound of the seventies turned the corner by tweaking the volume knob another notch or two clockwise into a louder, more aggressive zone. 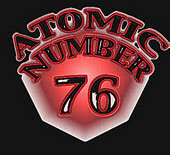 Atomic Number 76, AKA the "Heaviest Metal Known," is a three member NYC-based newcomer to the scene that first formed in early 2002. They're not big on fancy album titles or song lyrics. They are big on the explosive sound of the Arena-Rock circuit, circa '78 -- '82 where the riffs killed and the songs had volume, depth, hooks and solos, the listeners had lighters, and you could get away with singing about hangovers, booze, and women and everything was one big groove happy party till ya passed out. These ten tunes are catchy and immediate, conjuring up the spirit of "Destroyer" era Kiss, Nugent's "Free For All" and I'd dare say Black Sabbath during Ozzy's last days; And much as I try to evade it, "Hard n' Heavy" style Anvil definitely turns up. AN76 is tight and keeps it simple, aided by a rough mix, three chords, and Bluesy riff with enough bourbon-soaked and Skoal appeal to appease more than a few of the Southern Rock and Harley crowd. There's not much to dislike here, yet if there's one complaint, it's they sound too much like a dozen other bands that already did it before and they need to infuse more melody to avoid listener monotony by the time "Not Understandin's" riding out its last note. And I'll lambaste and laud 'em at the same time for copping so obviously Maiden's "Trooper" riff on "Bourbon Eyes" -- but if you're gonna borrow, why not borrow from the best, eh? Great overall vibe to an undeniably rockin' record that's impressive, if somewhat lazy at times.